Woohoo! Another finish this week! And DUDES, this one's been sitting in the UFO stack for months now. Several months ago, my Modern Quilt Guild had a challenge to make anything we wanted using Jay McCarroll's new "Habitat" fabric line. And the other one is finally finished: The Habitat Chevron Pillow! You all know I love a sensible chevron pattern, and I really like it with three gradating shades of aqua solid. I used the same fabrics in this pillow as I used in the Clamshell pillow - just a different design for interest on my amahzing and beloved crushed red velvet arm chair. The stacks of unfinished stuff . . . Seriously you guys, the UFO stack has gotten entirely out of control. over the course of the next year. Chances are, I'll still start some new projects, but I'm looking forward to having a pile of DONES instead of a pile of UFOs at the end of the year! 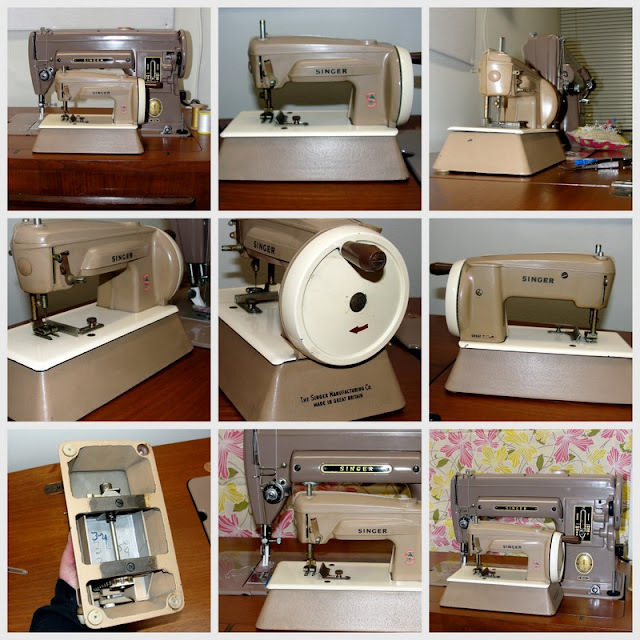 I think I've blogged before about my sewing machine. I use a totally wonderful Singer 301 sewing machine. There's tons of info on this kind of machine available if you're interested in the full history, but in brief, the 301 was "born" in 1951/1952 to mark the 100th anniversary of the Singer Sewing Machine Company. It's a slant arm machine, meaning the needle is at an angle instead of straight up and down. This makes it easier to see what you're sewing, and it's also super strong - - that little angle in the needle let's you sew through some crazy thick material and layers. By today's standards, there's nothing fancy about this machine. It's not particularly pretty, it doesn't have fancy stitches, and it's certainly not computerized like most modern machines. But, I have to tell you, I love it and I can't imagine sewing on another machine. So you can imagine my UTTER JOY when I rounded a corner last night at the mammoth vintage/antique store only to discover that my 301 had a baby! A metal children's toy made to look just like my real machine. And it works - with a little hand crank, this baby will sew a chain stitch. What a toy! Of course, it had to come home with me. It would have felt criminal to leave it there. It seems I have a little collection starting . . . This little mini quilt started as a personal challenge to experiment with curved piecing. Ultimately, I found that curves are not that scary at all - I'll share a tutorial down the line. I also made a New Year's Resolution to finish up all of the UFOs (unfinished objects) in my sewing room before I start on anything new. We'll see how that goes, but baby steps, right? For now, I'm here to reveal my big finish of the week—my Curvy Mini Quilt! I really do love a dense, straight line quilting design. It works particularly well, I think, to offset all of those circular bits. This little gem is now brightening up my cube at work. And I feel more confident piecing curves. AND I finished a pesky UFO! Half square triangles, or HSTs as you'll sometimes see them called, are one of the most common building blocks in quilting. HSTs are extremely versatile and offer a lot of design potential in your quilting projects. With a bunch of HSTs you can make a chevron quilt (like this one), a diamond design, or a scrappier layout ( and many others) just by simply twisting and turning the blocks. They're also a "gateway block" - - - HSTs are just a step away from quarter square triangles and loads of other quilty potential! There are several different ways to make HSTs, but this is my favorite method - - - two for the price of one! To make one half square triangle, cut two squares the same size from contrasting/coordinating fabrics. On the wrong side of one square, draw a diagonal pencil line from corner to corner. Place the two squares right sides together with the pencil line facing up. Using the edge of a 1/4" presser foot as a guide, stitch the squares together by sewing 1/4" on either side of the drawn line. Press each side open and there you have it - - - two half square triangles! Anyway, my friend Bethany sent me a link earlier today with this totally hilarious recipe, which inspired me to do some of my own experimenting with butter, sugar and food coloring. I've been growing more and more enamored with color blocking, and it occurred to me to try and make color blocked cookies. I think it worked really well, and I was amazed that the cookies stayed the same bright, brilliant colors through the baking process. Set a little time aside to make these, but know that they're really not difficult at all - just ever so slightly time consuming. I also bet you could use ready made sugar cookie dough and just color it, but I haven't tried it myself. Just think of the colorful possibilities!!! Mix a batch of your favorite sugar cookie dough. Divide into sections and add a different color of food coloring to each section. Mix thoroughly and then refrigerate dough for about an hour. On a thoroughly floured surface, place the lumps of colorful dough right next to each other. Squish them together a bit, and then roll the dough out. As you do so, make sure the different colors meld together. 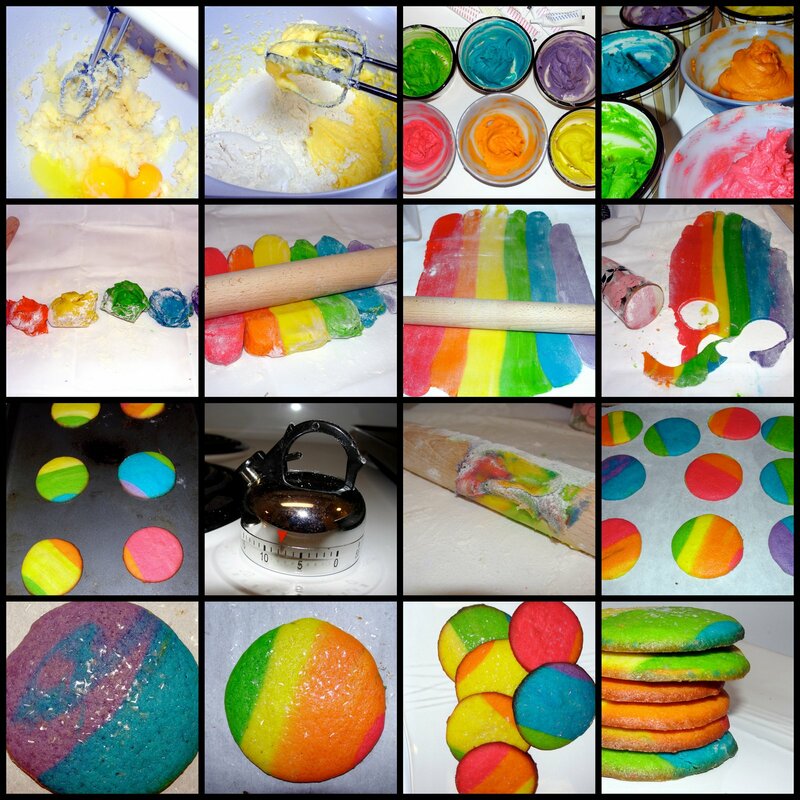 Use a glass or other cookie cutter to cut out the cookies, trying to get a few different colors in each cookie. Place them on a cookie sheet and bake, following your cookie recipe instructions. As soon as you remove them from the oven, sprinkle the cookies with a clear, edible sugar glitter. Allow to cool and enjoy!